You’ve done the work, now it’s time to get paid. Mobile invoicing is a quick and easy way for business owners to get paid fast. Here’s a rundown of what mobile invoicing is, its benefits to your business, and how to send mobile invoices free within the Square POS app. Mobile invoicing is an easy way to bill your customers right from your mobile device so they can pay you quickly and securely. Now you can send and manage electronic invoices free through Square’s free POS app on your phone or tablet. Send an unlimited amount of invoices free and only pay for each invoice that’s paid securely online. They’re really convenient. Over 80 percent of small business owners use mobile devices at least once a day to help run their business, according to research by Manta. Small business owners aren’t always in front of their computers, but they always have their phones at hand. Now you can send and manage invoices through our point-of-sale app, which makes it easier than ever to get paid fast for your hard work. As soon as you finish a job, you can send a mobile invoice from your phone no matter where you are. There’s no need to wait until you’re at your computer or to send paper invoices in the mail. 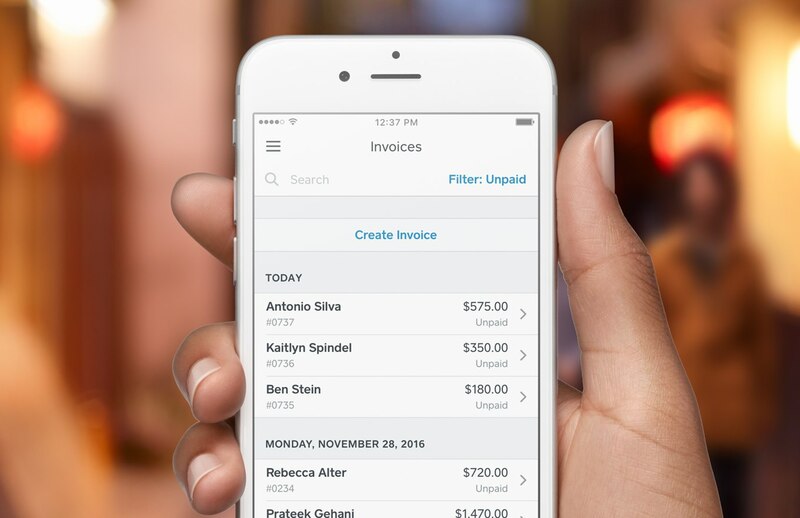 Free to use — Square’s mobile invoicing app is free. Download the app and send an unlimited number of invoices from your mobile device or desktop. Save time — Quickly create and send invoices anywhere, anytime, and quit spending hours catching up on your invoicing at the end of the week. Get paid faster — On average, Square’s invoices get paid in less than three business days. Once paid, funds from invoices are in your bank account in one to two business days. Convenient for customers — Your customers can easily and securely pay mobile invoices online from their phones or desktops with their debit or credit cards. If they’d rather pay by check or cash, you can easily log their payment in the system. Easy to manage — Keep track of which invoices have been paid and which are outstanding. With mobile invoicing, you can sort your invoices by paid, unpaid, overdue, sent, or draft, right from your phone or tablet. Send reminders — Have unpaid or overdue invoices? Easily send reminders to your customers from your mobile device to gently nudge them to settle their bills. Let customers pay later — Mobile invoicing can also be used to bill trusted customers who don’t have their credit card handy for in-person purchases. Simple search — Search for specific invoices by entering a customer’s name in the search bar. Seamless accounting integration — Connect Square mobile invoicing with QuickBooks and other App Marketplace partners for easy bookkeeping. No fees for your customers — You pay just 2.2 percent processing fee when the invoice is paid. Square’s mobile invoicing feature is conveniently located inside your free Square POS app. Using our in-app, customizable invoice templates, you can invoice from anywhere and send unlimited invoices free. Download Square’s free POS app, which lets you take credit card payments and send professional-looking invoices all from your mobile device. Select Invoices from the navigation menu. Enter your customer’s name and email address, then tap Add to Invoice. If you want to send this invoice at a later date, tap the Send option and choose another send date. Tap Add Item to add items from your item library, or enter a custom amount.